Those for whom the Judeo-Christian Bible is the basic religious authority, and who have urgent animal concerns, will find this compact book an enlightening and highly positive resource. 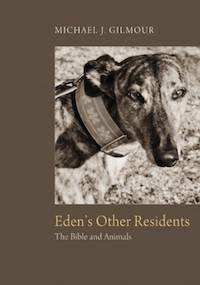 The author of Eden's Other Residents is head of the Department of Biblical Studies and Practical Theology at Providence University, an evangelical institution in Manitoba, Canada. Michael Gilmour is not a literalist, but clearly takes Scripture seriously while looking at it in terms of what might be called the message behind the message, that is, what it is saying in light of its cultural and historical context, and--this is important to him, as it should be to us-- what it means from God's perspective, not just the imperfect human view. At the same time, he is an animal lover and apparently vegetarian, concerned not just with animal "welfare" but also with understanding their culture, history, and experience. It must be frankly admitted that the Bible presents real challenges to animal lovers. The Hebrew Bible allows killing them and eating their meat at least since the covenant of Noah; it depicts as clever--almost amusing--acts of horrifying cruelty to animals like Samson's tying the tails of foxes together with a flaming torch inserted, and letting them run through the Philistines’ standing grain. Above all there are the dreadful sacrifices offered in the Temple and, earlier, at various other altars, with Leviticus giving the details. The New Testament, though presenting Christ's death on the cross as the final blood-offering which ended centuries of sacred death (in the book of Hebrews), contains such difficulties as Jesus sending demons into swine, who then drowned, or Paul claiming God did not care about oxen -- the prescription against muzzling them as threshing time was only an allegory explaining that, in modern terms, preachers of the gospel ought to be financially supported. Of course there are positive indications too: Proverbs 12:10 on the righteous caring for the needs of their animals, the sensitive words of Jesus about God knowing even the fall of a sparrow, the four mighty beasts praising God in the Book of Revelation. There are prophetic lines like those in Isaiah 1, in which God rejects the sacrificial blood of bulls and goats. But, to his credit, Gilmour devotes most attention to the hard passages. Here he seems to be guided mainly by three principles. First, he recognizes that the Bible reflects a long, slow maturation, under God's guidance, of human awareness of the divine and what it can mean in the life of the world. Thus some things that God allows are not the ideal, but concessions to human needs at the time, like granting the Israelites' desire for a king, or allowing them quail as well as manna in Exodus. One such concession was also the permission to eat meat in the covenant of Noah--after the sacrifice the great navigator offered. Finally, readers of The Peaceable Table may appreciate the last chapter, "Returning to the Garden: The Writings of William Bartram." Though a little surprising in this book’s context, this section presents the accounts of Bartram, a Quaker, who traveled throughout what is now the southeast United States including Florida, in 1771-77. In 1791 he published a remarkable book on this experience; it was mostly about nature, the various plant and animal species, what we would call ecology; sometimes the descriptions portray unspoiled nature as virtually Eden. Perhaps Bartram's work is intended to suggest what a missing book of the Bible might be like? Michael J. Gilmour is Associate Professor of New Testament and English Literature at Providence University College (Manitoba, Canada). He is the author of Gods and Guitars (2009) and The Gospel according to Bob Dylan (2011).